Psychologists tell us that powerful memories are often associated with smell. Turkey roasting in the oven on Thanksgiving, coming home and smelling dinner, baking bread or apple pie. Instant hunger. If I think about it I can smell my grandmother coming out of her bath in a cloud of Cashmere Bouquet, or my mother’s perfume as she leaned over to kiss me goodnight. She smelled like lillies of the valley. I love books. I love the smell of books. And I love libraries…they have their own unique smells and ambiance. But there is so much more to books then just the smell: trolling book stores, the wait to find one by a favorite author, the anticipation of first opening it, adjusting the pillows and sinking into the soft cushions of our loveseat, the feel of the paper, smooth or pebbly, the whisper of the turning pages. Ahhhhhh….. I have a kindle and now a mini-ipad, but there is nothing that beats a real book. 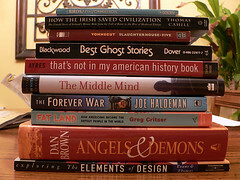 “But I want a book…” I try to explain. It’s like I’m in this big mental game of rock, paper, scissors. Ebooks are the rock tripping up the world of publishing and looking more and more like a giant glacial boulder. Ok, if you want paper, then self-publish. Paper covers rock. Well, maybe. But it feels to me like self-publishing is the thinnest, smallest paper, and requires money (which I don’t have), an effective self-developed marketing plan, (which I don’t have) and even more self-promotion skills, so lots of time. (which I don’t have.) I can see it working in some instances. The Shack is a mega-seller that started self-published. And a new writer at Wordsmiths, my writer’s group, has a great plan. I can see him succeeding brilliantly. So someday, perhaps, I might go that way. But I have always wanted to have it all: an agent, a publisher, an editor. I know it is next to impossible and growing harder by the minute to be published, but I can’t help it…I still want it. I want a book, and I want the confirmation that a real agent and a real editor think The Call is worth being a book. So, an agent and an editor, two blades of a pair of scissors that for now at least cut paper. Rock, paper, scissors…Ink! Round and round, I go. Others will choose what is right for them, but for now, for me, …back to my query letters. This entry was posted in Writings by Wordsmiths and Others and tagged Amazon Kindle, book, choices about publishing, E-book, e-publishing, Paper, publish, Publishing, Query letter, Rock-paper-scissors, self-publishing, Shack, Wall Street Journal. Bookmark the permalink. Real books. Moving to North Carolina, I knew I would need new historical underpinnings. I read Inglis Fletcher’s dozen Carolina Chronicals. I bought them one-at-a-time from on-line used book dealers. The first was published in 1939, over 70 years ago. History does not go out of date, but there is no way that Amazon.com will be supporting today’s Kindle file formats and devices seventy years from now, if Amazon.com still exists. When I settled into retirement, I began to acquire Braithwaite’s Anthology of American Magazine Verse, 1913 to 1929, after I ‘discovered’ one in a used book store. William Stanley Braithwaite was the Poetry Editor for the Boston Transcript. He could not find a publisher for poetry books, so he borrowed money to publish them himself. There is Absolutely no way that today’s ebooks will be available in 100 years. The computer industry accelerates obsolescence. I admit that it’s a kick to watch my wife read my poems on her smart phone, but I know she buys a new cell phone every two years. Hello. Goodbye. Hi Mike…I told you I had started a post before Monday’s group….this is the finish of it. But I hope you saw the comment I added about you. If anyone can make a success of self-publishing or e-publishing it’s you! It’s funny you talked about looking for historical underpinnings to live here. I did almost the same thing. Though I only recently discovered Inglis Fletcher, I found some great texts – info on the Culpepper Rebellion in Perquimmans County, the land controversy over Durant’s Neck, a letter from a woman who lived through the Yankees invasion of Elizabeth City and told of their taking all the court records in a wagon into the Dismal Swamp where they spent the rest of the war. I just love discovering gems of history like those. Anyway, thanks for commenting. I’m with you. At least for now I want to show that with God’s help I’ve earned the right to call myself an author. Maybe afterwards I might change my mind, but right now I’m still looking for the Lord to show me the way. I think then I’ll have the confidence to tell the world I have something that some publishing house was willing to gamble on, and it’s worth their hard earned money. It’s hard for me to promote a product that ‘professionals’ in the field didn’t think was one yet. Well said Ted. I completely agree. I keep thinking God has a plan for all of us in this.